Mitreo dell'Esquilino – Mithraeum. Our Common Sun. On the Esquline (Via S. Giovanni Lanza 128) a Mithraeum was discovered near the Church of S. Martino ai Monti in 1883. In a house from the time of Constantine or a little earlier, a Lararium was found with a statue of Isis-Fortuna and smaller statuettes of Sarapis, Jupiter, Hekate, Venus, Mars, Hercules and others. A door next to it opens on a lower room, which served as a Mithraeum. Via two flights of seven and nine steps, separated by a landing, one descends into it. 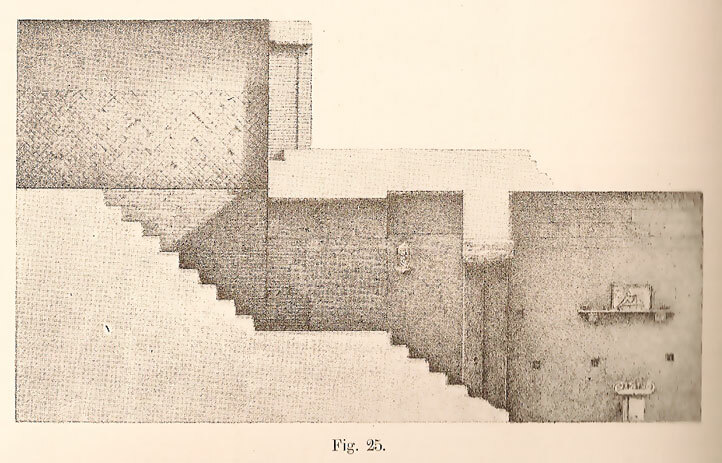 On either side of this landing there is a niche in the wall, in which the two statues of Cautopates (l). In the r. niche traces of red-paint. The sanctuary itself consists of a small, arched room (L. 3.70 Br. 2.43). In one of the side-walls a marble slab has been fixed (L. 1.23 Br. 0.36), which is supported by two brackets, which are decorated by leaf-work. On this slab we see a marble Mithrasrelief. Moreover there were some small vases (diam. 0.10) and the remnants of seven torches of fair-wood, which were covered with tar. Underneath the slab on the floor stood a square column with an upturned Ionian capital. The whole probably served as an altar. In the wall several small niches have been hewn out. Four of them, two arched and two square ones, are on the left between the entrance and the cult-niche, two more below the marble slab and two to the left of it, and finally one more in the opposite wall. They probably contained lamps.